My coworker Susan sometimes makes a pasta similar to this: simple and satisfying with fresh ingredients and a sprinkle of toast fresh bread crumbs for a little crunch. If you have a few small tomatoes, such as sungold grape tomatoes, they would be great in this pasta too. Broccoli rabe, if you're unfamiliar with it, is a green with small heads that resemble broccoli. 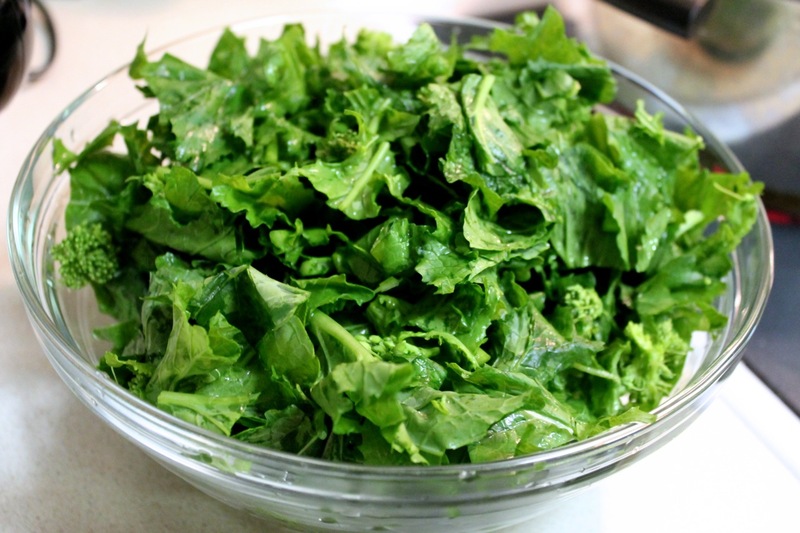 A member of the mustard family, it's also often called "rapini." Don't confuse it with broccolini, which is a hybrid of broccoli with with smaller florets and longer, thin stalks. I've said this before about anchovies, but I'll say it again: don't be afraid of them. They won't make this dish taste fishy. Honestly. They provide a nice meaty undertone that mingles well with the garlic and other flavors. They can really give a simple dish like this a nice flavor boost. 1. Trim the crusts off the bread and tear into pieces about 1-inch wide. Place bread in a food processor and pulse a few times until a desired crumb is achieved. 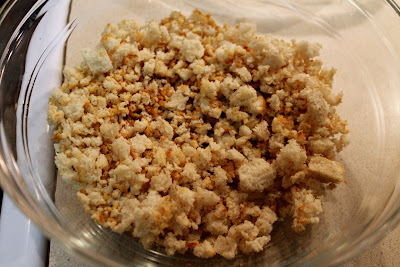 Transfer crumbs to a medium frying pan over medium heat. Cook, stirring occasionally, until the bread dries out and browns a bit, about 15 minutes. Transfer to a bowl. 2. Bring a large pot of salted water to boil. Add pasta and cook about 5 minutes. Add broccoli rabe and cook another 5 minutes until the pasta is al dente and the broccoli rabe is tender (adjust initial pasta cooking time depending on how long the pasta should cook to allow broccoli rabe to cook for 5 minutes). Reserve 1/2 cup of pasta cooking water and drain the rest. Return pasta and broccoli rabe to the empty cooking pot. 3. Heat olive oil in a medium frying pan over medium-low to medium heat. When hot, add garlic, anchovies and red pepper flakes, stirring with a spoon to break up the anchovies. Cook for about 3 minutes, watching carefully to prevent garlic from browning (it should be golden, but not brown, which will make it bitter). 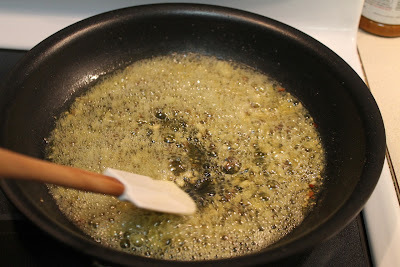 Pour mixture over pasta, add reserved pasta water and stir to combine. 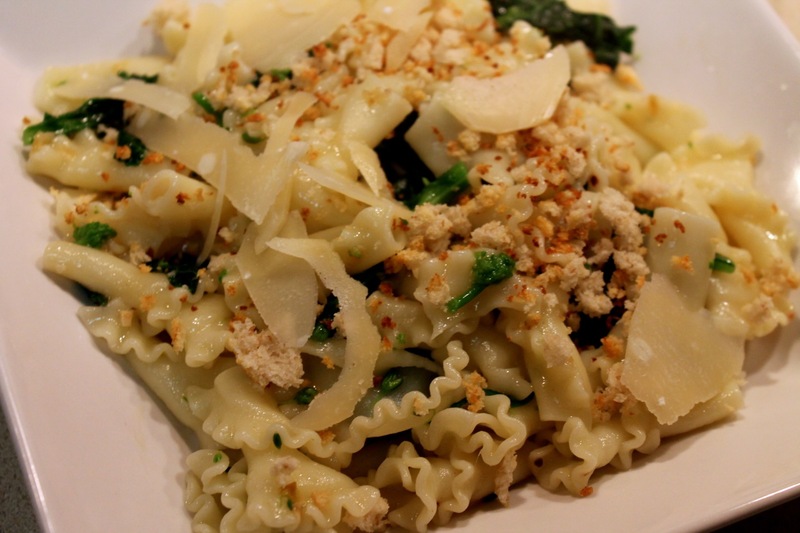 Serve pasta in shallow bowls topped with parmesan shavings and toasted bread crumbs. Cook In / Dine Out readers: Believe Andrew when he says anchovies won't make your dish taste fishy. It's true. I'm no fan of fish (I generally eat only salmon), but when Andrew cooks with anchovies, I'm none the wiser. As he writes, they provide a nice flavor boost but not a fishy one.